Do you have a secret santa gift to buy? Do you need some last minute stocking fillers? This is the gift guide for you! I've found some great gifts on the high street under £10 and I'm here to share them with you. It goes without saying that I love my scrapbook. My mum bought mine for my birthday and I've really enjoyed getting pictures printed and filling up the pages. I think this is a great gift for someone special in your life. You can fill the first couple of pages and then leave the rest blank so it can be continued. There are so many scrapbooks you can buy from places like Poundworld or Ebay and I just use a prit stick to seal the photos. I also use the app free prints to get my photos - you get a certain amount free per month and you just have to pay for postage. If you're looking for affordable beauty products then Freedom makeup is a great option. The products are so affordable and my favourites are the lip trio set and the custom eye shadow palettes. Another alternative is Make up Revolution or MUA; they're all available at Superdrug and the quality is really great for a budget product. During the winter months it's important to stay warm and this Owl Hottie is a great alternative to a hot water bottle. This one smells like lavender and you simply pop it in the microwave for 90 seconds. It's so calming and definitely warms you up. I like to put mine in my bed covers a couple of minutes before I get into be so it's all nice and toasty! You can get them at find me a gift for as little as £8.99. Like the scrapbook this is a slightly different type of gift, but one that will go down surprisingly well. I wouldn't have bought one for myself but since I was given one I've found it so relaxing. You can get lots of different types; Harry Potter, Cats or just floral patterns. I love mine! A portable phone charger is always a winner for any tech lover. You can get them pretty much anywhere; Ebay, Primark or any department store. I bought this one from Primark and it's great. I was £6.00 and can charge up to three full phone charges. It's perfect for festivals or just when you're out and about. Primark do lots of amazing pieces of jewellery and this earring set is just £1. I've been loving hoops recently and you get five sets in this pack which is such amazing value. I know they're not the best quality but if you're looking for an extra gift to add to a stocking then this is perfect. It's no secret that this weather is getting colder and colder and just a short walk from your house to work can make you feel like you're a walking icicle. A woolly hat is a great idea for both the men and women in your life. I particularly love the burgundy colour as I feel like that is very autumnal. I also love a good bobble on the end too. You can even get hats with built in bluetooth to enable you to listen to your music. 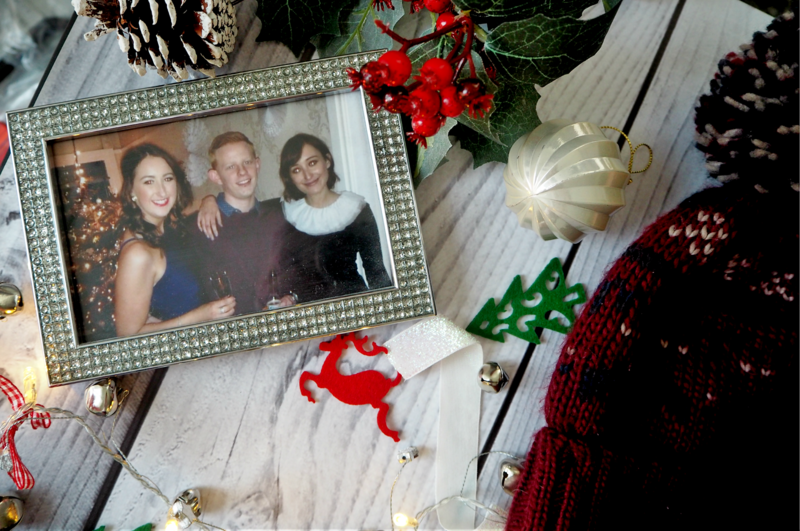 The final gift in my under £10 gift guide is a photo in a frame. I think this is a lovely personal idea and you can put a photo of you and the person in it. You can get some great frames on the high street; some of my particular favourites are from poundland. Jay bought me this one last year and put a picture of him, my twin sister and I in it and I love it! If you know an avid gym lover, why not buy them some new gym kit? There are so many affordable pieces out there on the high street so why not add something to you friends stocking? I found these cute pink cotton trainer socks from Storm Bloc* and they are SO comfy. They have breathable panels which is great for working out to aid moisture and they're such a cute colour too! You get two pairs for £9.99 which is a bargain and a great top up stocking filler. There you have it - my top gifts under £10. Have you got all your Christmas gifts yet? I'd love to know what you've got your family and friends! Make sure you're also following me as I've got lots of Blogmas posts coming your way!